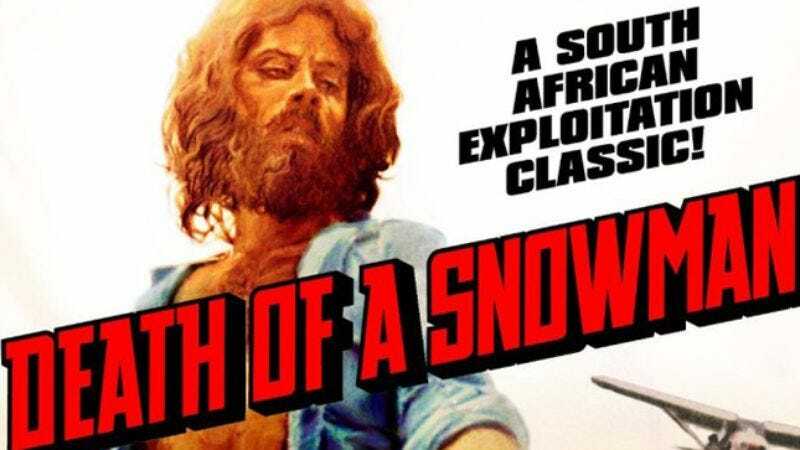 Plot: In crime-ridden South Africa, a shadowy organization emerges from the underground to take on the pimps and drug-dealers. They call themselves “War On Crime,” and announce plans to take their proceeds from crook-busting and divert them to needy black children. In actuality, though, the WOC is itself a criminal endeavor, run by a mysterious Mr. X, who’s looking to wipe out the competition. At his side are multiple henchmen, most notably a hairy, ruthless hitman played by the movie’s screenwriter, Bima Stagg. Whenever Stagg leans in to kiss his waifish girlfriend, and the light hits them just right, he looks like an ape from Planet Of The Apes about to violate some ape law. Enter Ken Gampu, the indestructible beat reporter of Soweto. Gampu has all the inside scoop on crime and who’s responsible for it. Mr. X tries to throw Gampu off the trail by feeding him scoops, which puts the reporter on the bad side of the local police captain. But Gampu has a friend on the force in Nigel Davenport, a lieutenant who works alongside Gampu to investigate War On Crime. Gampu also has colleagues in New York digging through their archives to see if they can match a sketch of Mr. X to any known American black militants or gangsters. While they do the legwork, Gampu wanders the city, forlornly feeding the ducks like the badass loner he is. Can easily be distinguished by: The funky music, which represents the first soundtrack composed by future Yes member—and go-to blockbuster-scorer—Trevor Rabin. Sign that it was made in 1978: While on a stakeout, Gampu and Davenport pound down a couple of Lion Beers and a couple of boxes of Kentucky Fried Chicken with the old-school KFC logo on them. Available on DVD from Synapse.